"I am Ranch Soil (Christopher Nicholas Maeder), formerly Hexcalk/Totalist. Ranch Soil is a project usually focusing on experimental animations, electronic music, the M.U.G.E.N fighting game engine, TrackMania, OpenRA: Command & Conquer, et cetera. This 9-floor metal map, "Octagons of Painful Vertices", is an attempt to make a Quake map again. It is basically full of hordes, has limited health and ammo, and is vertical. If this fails, then I'll very potentially abandon FPS altogether. 342 enemies in cramped spaces are crazy, but no difficulty settings because I want this to be as hard as possible, which is why no testing (other than me trying out the map for myself if I were testing my own works) happened here." you should zip up your bsp and txt in one archive. Screenshots, screen captures, previews, pictures, ... is that so hard? But this isn't a map. I don't want to be unduly harsh, and I'm already annoyed for various unrelated reasons, but this is not fun. I Am Gonna Be Honest With You. It seems like you were trying to do a slaughter map but you just ended up making a parody of a slaughter map. The problem is not the fact that is full of hordes, it is that there is only hordes in the entire map, of one enemy at a time. If you are trying to make a map based around hordes, i suggest you mix up combinations of enemies or make arenas where the player has to tackle fights differently. I dont know if you are new to quake mapping (or this is just an elaborate joke)but I recommend that you see dumptruck_ds videos on mapping. They were really usefull to me. "If this fails... I'll abandon fps. " The author sounds disgusted with their own work even when promoting it. Seriously there are no screenshots for a good reason. It's one bland 'room' with a single texture copy and pasted 300 times. Should be titled "Baby discovers a map editor." (and yes it is fullbright btw). For example... all the enemies in the first room (a horde of dogs) are stuck in the floor and can't move. Did you even try playing it after hitting compile? Image that but 9 nine times. Geez HansMoleman!!!!! Baby discovers a amp editor. I've seen and played his past maps before and they do fall short in many ways. Maybe someone could point him to Dumptrucks tutorials on mapping. Maybe a little push from some of the other mappers.....God knows there is a crap-load of excellent ones out there. Uhhhhhh, not sure what to say about this without insulting the author. So I won't say anything at all, except.............Oh God! Replays? (Nearly) impossible to beat? The shamblers floor is obviously impossible to beat. I've beaten all others. This map is an effortless attempt, and all things considered, it's just a passive-agressive jab at people here. Funny how your Mugen levels aren't any better. Readme file, for those interested. Well, perhaps this broken map lives up to its name, and I'm very amateur. Amateurs tests their own work before releasing it. Amateurs may not have the knowledge, but they do put in the effort. They do try to come up with interesting things. Interesting. 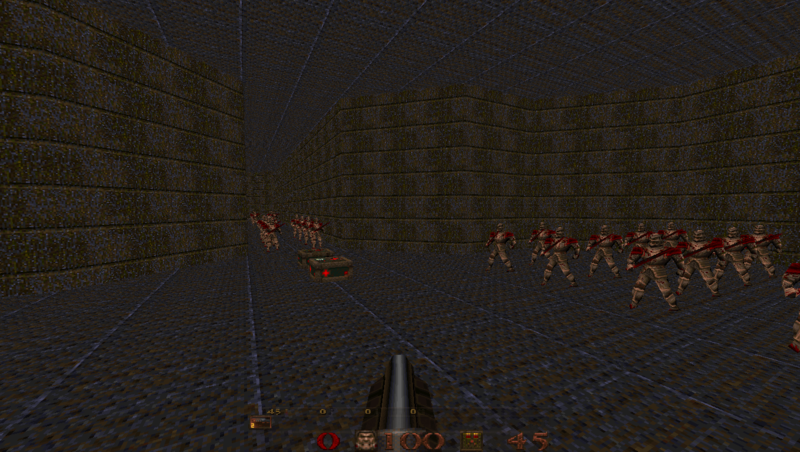 But if I don't do well at making Quake maps, then Hexen II. However, I don't have enough time for FPS, so most likely I could take a break from mapping. #13 - you may have a point but that level of insulting requires being a registered user for accountability. Hexcalk - it seems clear that you are trolling / joking with this map. It would be best if it was not submitted as a news item. If you wish to improve and make quality maps that are of interest to players, there's plenty of resources to help you. If you wish to make simple jokes, just do so in the General Abuse thread. I used the Quake Level Design Starter Kit 1.6.0. Strong contender for map of the year.